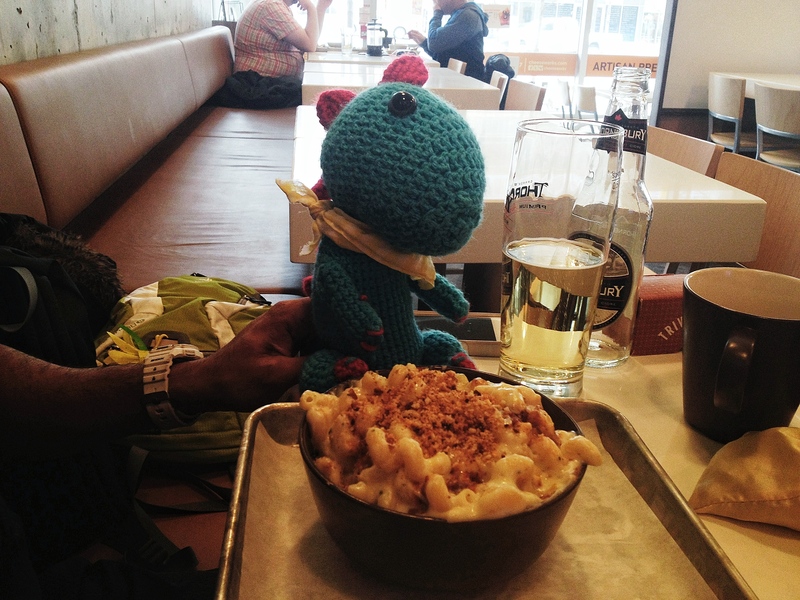 Me and Brad’s fave newly-discovered eatery of 2012 was definitely CHEESEWERKS. (Brad is so in love, he got gift certificates for Christmas.) As their name implies, they are all about the cheese there (gourmet grilled cheese being their specialty) so it may not be the best choice if there are lactose intolerants in the crowd. But for those who can handle their dairy, omg. Their brunch is to. die. for. Cheddar waffles with chicken, guacamole, chipotle aioli, and a fried egg, anyone? They also have board games on hand, if you’re in the mood to play!”With that kind of glowing reference there was no way I could miss! 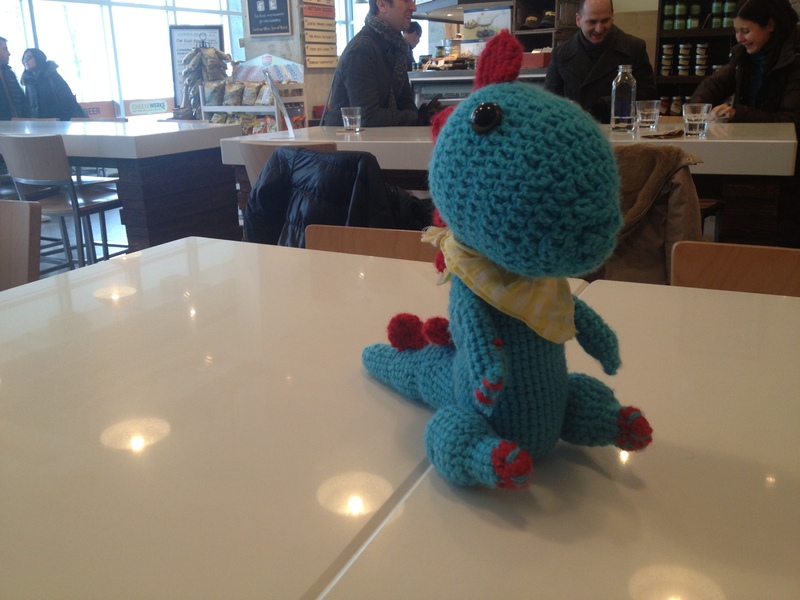 So Benny and I headed over to Cheesewerks, stomachs growling, on a particularly cold and windy Sunday in February. Joining us on this adventure would be Squiggy, Jodee and Robyn herself! 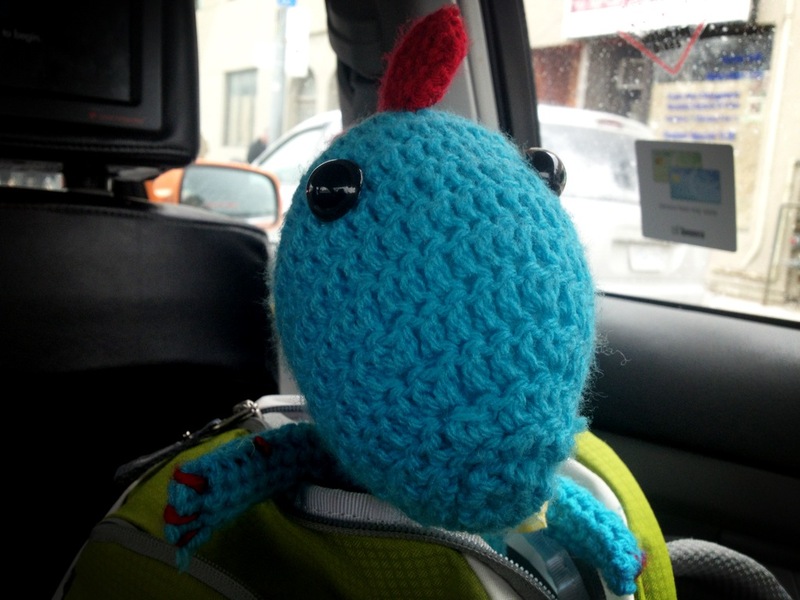 Benny in Backpack Ready to Get His Eat On! 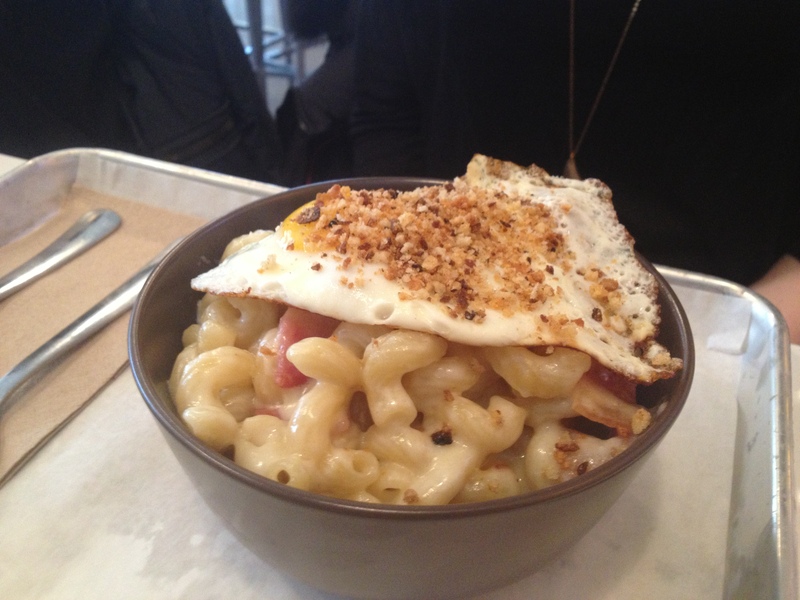 Cheesewerks is an independent family owned and operated restaurant. It is clear when you enter the restaurant that this isn’t one of those takeaway speciality joints like the poutine shops that are invading Toronto. The restaurant has a modern look with clean lines and exposed concreate. They warmed up the space by adding lots of warm ‘cheesy’ colours and dark and light wood. One side is floor-to-ceiling windows so it brings in lots of light during the day. First order of business is to order at the counter. Their menu is crafted with a selection of what they call artisan grill cheeses. Their “Legend Dairy” Grill Cheese options offer variations inspired by cities such as Charleston, Houston and Beijing. While their focus is exclusively cheese, they pair their selections with homemade soups, housemade sodas and signature mac and cheese dishes. They have a special brunch menu with eggs benedict versions of their Grill Cheese Cities and other interesting breakfast items: morning macaroni, anyone? 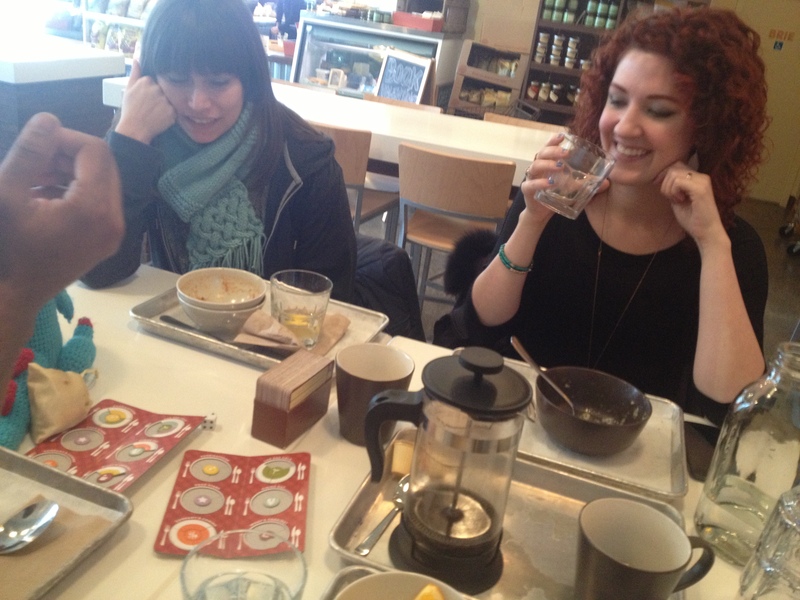 While we waited for our orders to come we enjoyed some french-pressed coffee and played a rousing game of Foodie Fight. Note-to-Self: Never play a food trivia game against a chef! Three against one and we still got trounced! 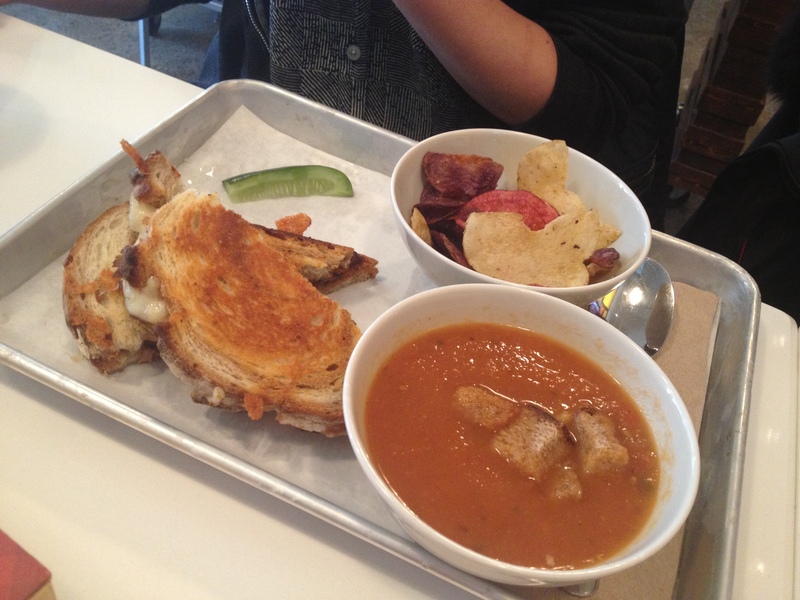 Jodee went for the Original Grill Cheese Sandwich which comes with a side pickle and kettle chips. She decided to add the Roasted Tomato Cream Soup because, why not? I can see why Robyn and Brad frequent this restaurant. They use quality products and deliver truly balanced dishes. They even go as far as to match up different bread with each iteration of their grill cheese. This is why they specialize in Grill Cheese and boy, do they do it right! 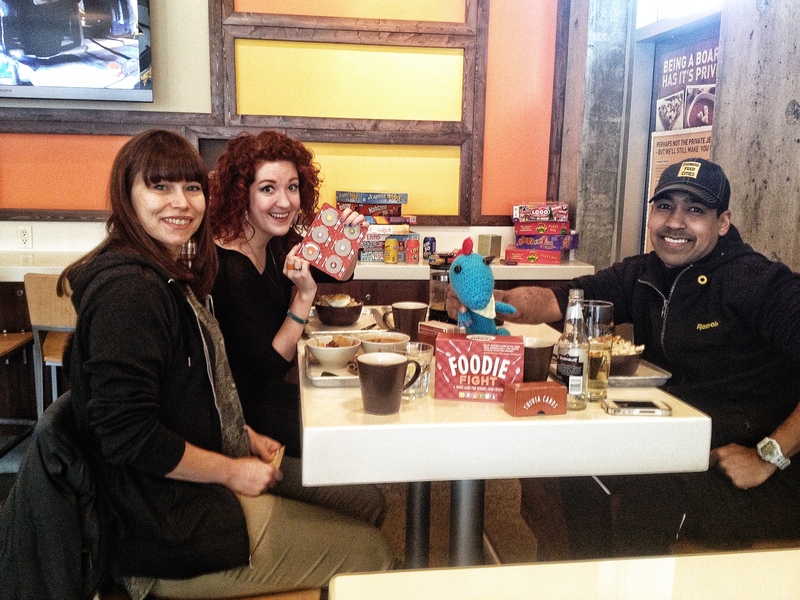 Overall, we had a great time at Cheesewerks and Squiggy even got a quick pop quiz from one of the owners! They have Food Fight Trivia Nights for the most seasoned foodie every few weeks. We’ll have to come again for trivia, a cheese fondue night or maybe a Country Mouse City Mouse excursion!